About the site . 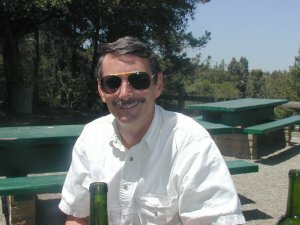 . .
Winebork.com was originally written by the legendary Dr. Mark Alguard to collect the wine opinions of a group of Silicon Valley physicists and engineers who had been drinking wine together for more than 30 years. The site was begun for fun, but developed over time into a religiously maintained record of the group's wine tasting activities. The group has dispersed in recent years and the site has been completely rewritten by me (H.T. ); the collection of reviews is now more in the nature of a personal wine diary than a collection of group tasting notes. 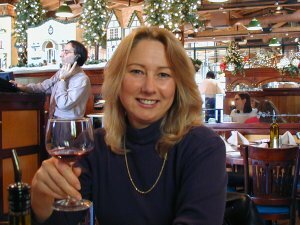 I post here opinions of each new wine I sample, though the site itself includes many of the earlier group reviews. The reviews are based on a leisurely pass through a full bottle of wine, and not on an isolated sip at a winery or formal tasting. The wines are often tasted blind, though not exclusively. I'd love to hear your opinions as well. There's an email link in the the navigation bar. Email any comments you might have on a given wine and I'll add them to the review. (I've been forced to forego online feedback because of past external hacking issues with online forms). Origin of the name "Winebork". . .
Oct. 1973: At President Richard Nixon's command, Solicitor General and Presidential lackey Robert Bork fires Special Prosecutor Archibald Cox after both Attorney General Elliot Richardson and Assistant Attorney General William Ruckelshaus refuse to do so. Nov. 1973: San Francisco underground rock station KSAN airs an uncanny re-enactment of Orson Welles' 1930's War of the Worlds radio broadcast, in which Mars invades New Jersey. In the re-enactment, however, the Martian invaders roam the earth turning innocent humans into "Mindless Borks." Nov. 1973: Inspired by the example of fellow grad student D. Whitmore, who listened to the entire KSAN broadcast while consuming two bottles of previously frozen Grand Cru Burgundy, G. Ketner and H. T. King add "Mindless Bork," or simply "Bork," to their name-calling repertoire. This term is not a compliment. 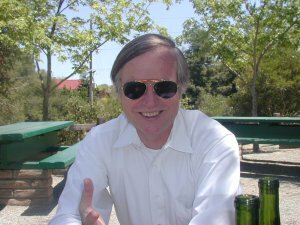 Jan. 1985: Having moved back to the Bay Area, H. T. King introduces the term "Bork" to his California wine tasting compatriots, who immediately recognize its utility as a putdown when applied to one another in differences of opinion on wine. June 1991: Little Amy Van Munn, daughter of Pat Van Munn, mutters to her mother, "Oh no - here come the wine dorks again." We presume little Amy has mispronounced the "Bork" epithet she had heard so often in her infancy, but in retrospect she may have been more perceptive than we thought. In her honor we named the site - registered in Feb. 2000 - as "winebork.com". H. T. King was transformed in the early 70's from clumsy beer-drinking grad student to suave wine enthusiast (read: junkie) via exposure to, and over-indulgence in, a Chateau Malescot St. Exupery supplied by mentor G. Ketner. The passion intensified during a three-year stay on the East Coast when buying fine Bordeaux and Burgundy did not break the bank. (Cheval Blanc under $10! LaTache under $20!). The wine lust reached perilous levels in the mid 80's with a brief stint as office-mate of fellow zealot Pat Van Munn, during which they "invested" their entire children's college funds in '82 Bordeaux. With age and maturity, as well as relocation to the beautiful Russian River Valley, reason has returned, though H.T. also admits to having no free closet space. 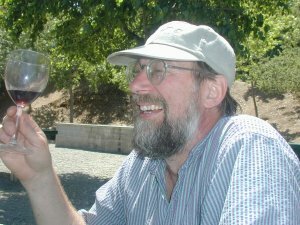 Infected with the wine bug by his office mate, Pat Van Munn has dedicated the last 30 years to refining his palate and polishing magisterial (not to mention mind-numbingly pompous) phrases related to wine tasting. Afflicted in later years by a case of screeching paranoia, PVM has installed a wine cellar deep beneath his estate, where he still regularly repairs to gloat over his best purchases. He possesses a particularly healthy passion for bone-jarring Sonoma Zinfandels. Charter Winebork #3, Paul Houghton, legendary pilot and mountain man, has a palate capable of micro-point resolution, a level of discrimination reflected in the almost imperceptible differences he applies to the word "like" in the statement "I-I-I-I-I LIKE it!" Known to fly off at a moment's notice to vineyards around the country to catalog the nuances in individual grape clusters, his airplane is the only Mooney run exclusively on the fumes from empty Martinelli Jackass Hill Zinfandel bottles. Mark Alguard possesses a wine collection notable for enjoying the shortest average cellaring period in the civilized world. The primary explanation is that he has never been known to buy a wine that actually requires cellaring in the first place. Fortunately he still has an adequate supply of "friends" who take a longer view. 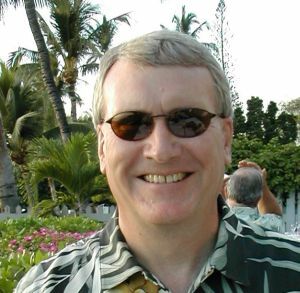 Mark is the genius behind the original Winebork site, undertaken during a temporary period of independent wealth in the years of the dot-com boom. The shock of market corrections has since reduced his average expenditure per bottle to a vanishingly small number. Quiet and unassuming, Anna Stockel can still be coaxed to utter the occasional mildly-worded opinion. (Example: "These cretins should be publicly disemboweled for putting this stuff on the market."). Certainly we all agree that her intrinsically shy nature can be overcome only in moments of supreme emotion, such as when sipping a perfectly aged Ridge Monte Bello Cabernet. Winebork Emeritus G. Ketner was genetically engineered in utero to possess a perfect palate. 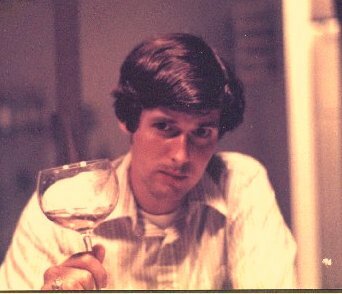 Pictured here in the bloom of youth, swirling a '70 Batard Montrachet and preparing to utter something so egregiously pretentious as to peg the Pompmeter, he is the renowned holder of the largest collection of off-year clarets in the Western Hemisphere. ("'69 Haut Brion, anyone?") Now in the prime of life, he is saved from terminal pomposity only by monstrous daily infusions of Premier Cru Burgundy.